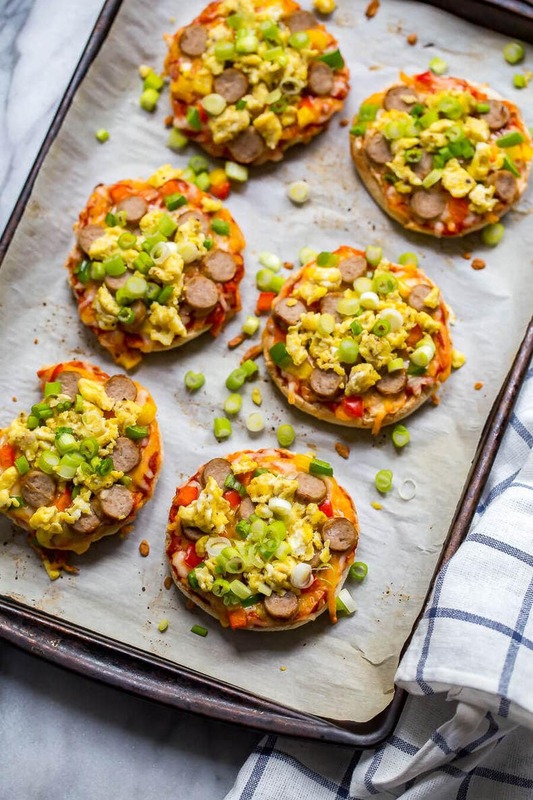 These Freezer-Friendly Mini Breakfast Pizzas with turkey sausage and egg are the perfect grab and go option for those busy weekday mornings! Pop one in the microwave and enjoy on-the-go! Breakfast is always my most-hated meal of the day. Even as a kid, I remember waking up super early and watching cartoons by myself while everyone else in the house was asleep, not feeling hungry for what seemed like hours. And I would absolutely dread the second I felt my stomach rumble because at that point, I knew I had to get up, interrupt my blissful morning alone, and make myself something to eat. Which was usually some boring, bland type of food I hated, like cereal or toast with peanut butter. As an adult, I've actually really come to love a good English muffin with peanut butter or an everything bagel with some butter. Gimme the carbs please! But I still feel like breakfast is the bane of my existence. I'm either too tired or too lazy to make it, and I hate most breakfast foods. Don't even talk to me about smoothies okay. I am NOT here for a fruit overload, and too much dairy in the morning (even Greek yogurt!) makes me a tiny bit queezy. So what's a breakfast-hating girl to do? Grab something out of the freezer!!! 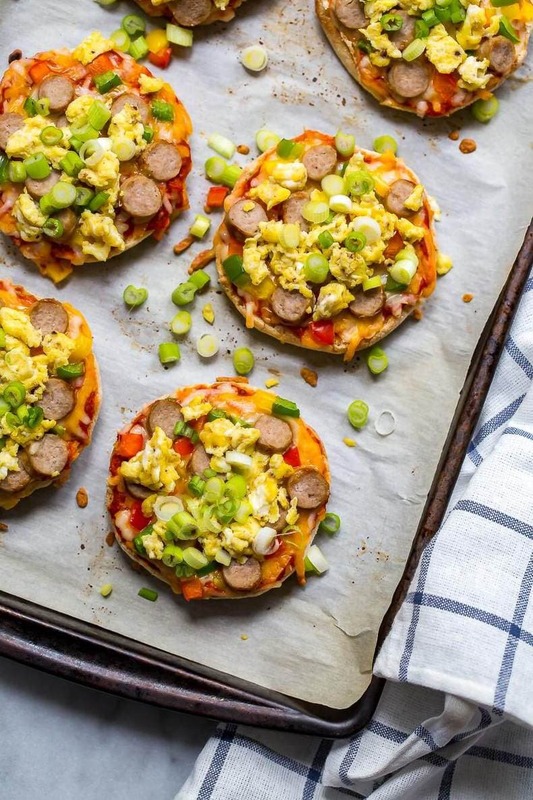 Freezer-Friendly Mini Breakfast Pizzas to be exact. These things are basically the most perfect mix between breakfast and lunch, and they require no work at all once you've assembled them ahead of time. 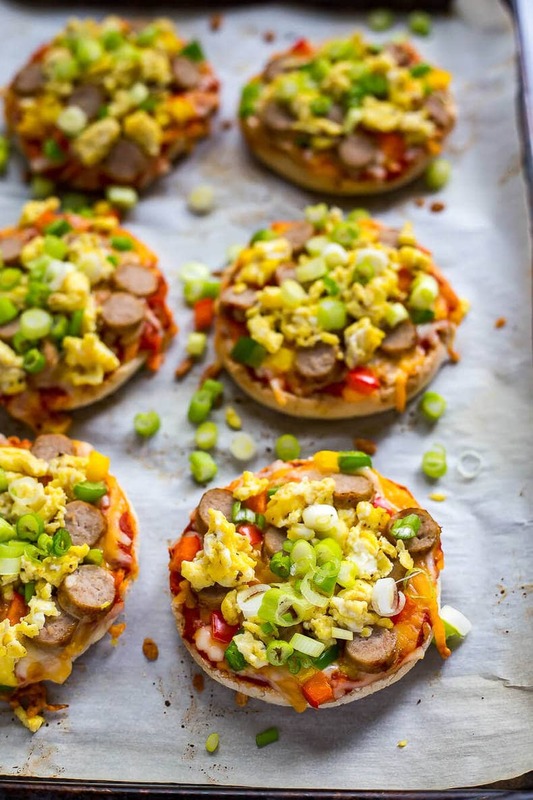 I would love to say that making these mini breakfast pizzas is a walk in the park, and for the most part it is. But you do have to make a bunch ahead of time, which will require at least 30-40 minutes out of your day on a weekend to get them prepped for the work week ahead. I don't know if it's a 90s kid thing, but I remember making mini pizzas on English muffins like this quite often as a kid. It was actually the best kind of Friday night treat: my parents would have the toppings all cut up and prepared like a little pizza bar on the counter, and my brother and I would go nuts making all kinds of different combinations. The simple things in life right? 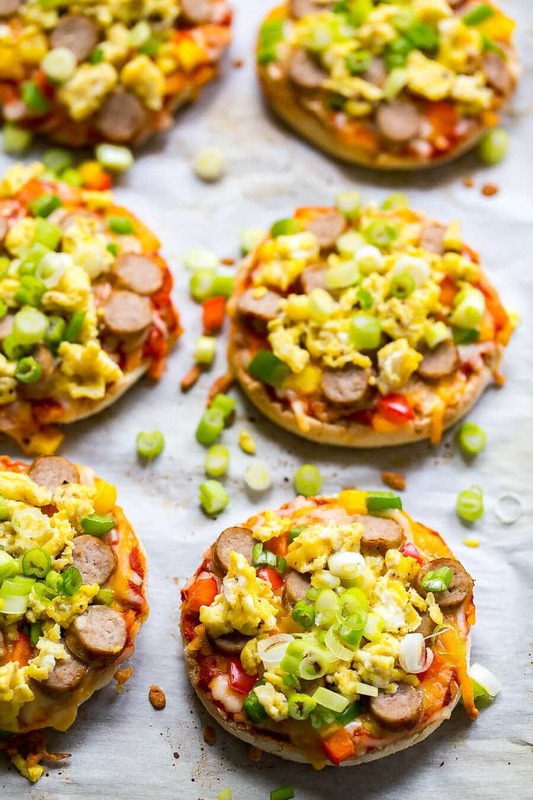 So, we've got a similar idea going on here for these Freezer-Friendly Mini Breakfast Pizzas. Grab a package of English muffins, spread a little pizza sauce on 'em. Top with cheese, mini breakfast sausages and bell peppers. Bake at 450 F for 10 minutes. Remove from oven and top with scrambled eggs and green onions. Serve and enjoy – OR freeze in a large plastic bag and enjoy later! I used turkey sausages here to cut down on calories and fat, but you could also go with turkey bacon or just leave the meat off altogether. Although I really think the sausage is what makes these!!! Those and the bell peppers. What I have been doing lately is almost mincing bell peppers and cutting them so fine that they get kind of juicy and cook quicker. Peppers bring the best kind of flavour to just about everything, right? If you don't have any on hand in the fridge though, you can always sub in other types of veggies like broccoli, mushrooms, zucchini, tomatoes, red onion, etc. Like almost all of my recipes, this is another one of those veggie dump recipes. Dump all the veggies in your fridge all up in here! Yaaaaaaassssss. Healthy, and waste-reducing. 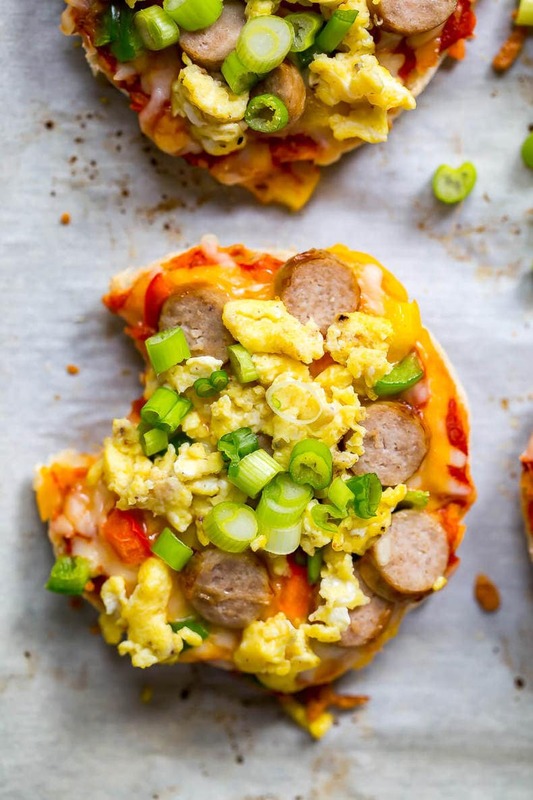 You can also use a few shortcuts to bring these mini breakfast pizzas together in a jiff. Use pre-shredded cheese, for instance, or maybe even little turkey pepperettes instead of having to cook the sausage ahead of time. Prepared veggies also work here – you don't need many to get a ton of flavour. You just want to be a little bit healthy here. After all, I've heard breakfast is the most important meal of the day or something? 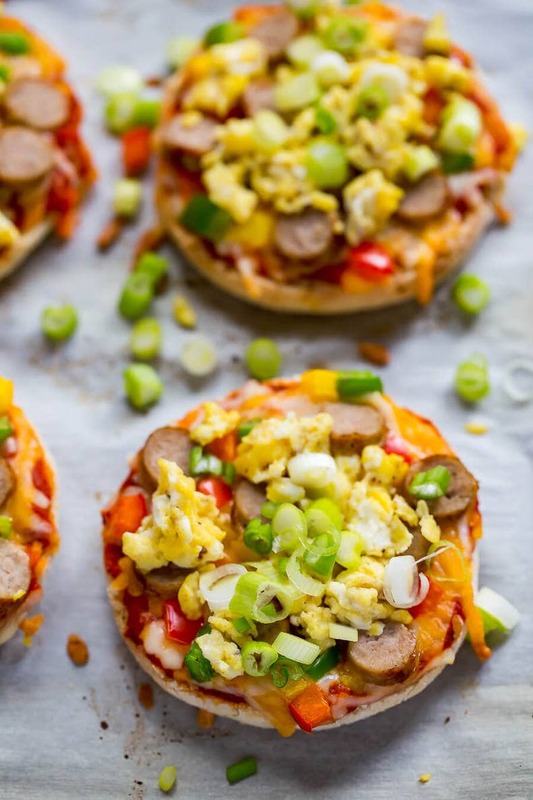 Will you be making these Freezer-Friendly Mini Breakfast Pizzas? I'm telling you, there's nothing better than opening up your fridge or freezer and seeing the day's breakfast already prepared, and knowing that it's gonna taste WAAAAYYYYY better than boring old cereal or oatmeal. Keep your healthy grandma-like breakfasts to yourself! I'm getting in on the breakfast pizza trend! In a large skillet, heat olive oil over med-high heat. Add breakfast sausages, cooking for 13-15 minutes until fully cooked inside. Remove from heat and set aside. Meanwhile mix eggs together in a medium-sized bowl. How many eggs you use depends on how much you want to top each English muffin with. I used 2 in these pictures, but you may want slightly more. Slice English muffins in half, then top with pizza sauce and shredded cheese. Add peppers and sliced sausages. Bake for 10 minutes. Remove from oven and top pizzas with scrambled eggs and green onions. Serve and enjoy! To freeze, wrap in plastic wrap and store each wrapped pizza in a large ziploc bag. Defrost in the microwave for approx. 3-4 min until heated through. I find they do best if you reheat in the oven for 10-15 min but you could reheat in the microwave for 2-3 min. I imagine the crusts wouldn’t be as crunchy microwaved but they would still probably taste good!! !